Playwright/songwriter/performer Noël Coward was born in 1899, and spent much of the 20th century documenting modern life in Great Britain. He wrote and sang about the rich and poor, finding commonalities of character across the social classes. He believed in the inherent virtue of his people—even when he found English folk funny or sad—and he converted his affection into activism during two world wars, offering his gifts to the military to use however they liked. By many accounts, Coward was willing to fight. But his country preferred that he entertain and uplift. Coward made the most of that arrangement when he wrote, produced, co-directed, and starred in In Which We Serve, the only motion picture that can fully be called “a Noël Coward film.” His plays have been adapted to the screen fairly often—sometimes with his direct participation—but this World War II movie remains the purest expression of what could’ve become an entire Coward filmography, had he carried on in that direction. 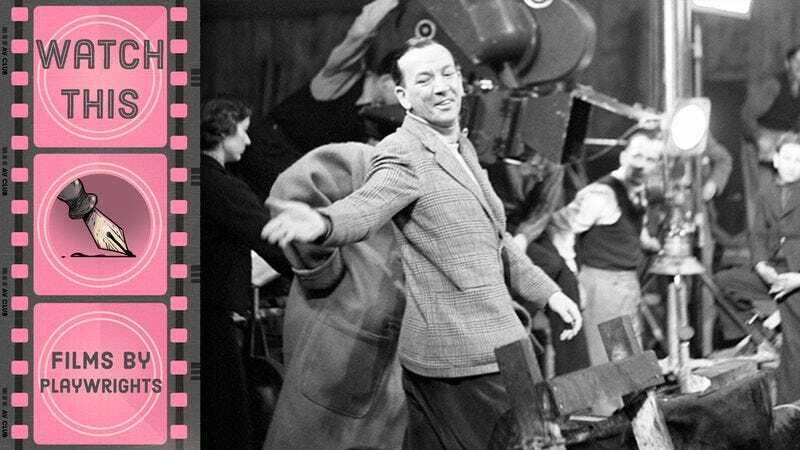 Though he had help from cinematographer Ronald Name and editor/co-director David Lean—both of whom would go on to stellar careers in the British film industry—Coward was largely responsible for the many long dialogue scenes, keeping the energy high and the actors framed to their best advantage. Based on a devastating naval defeat that in real life had helped to rally the home front, In Which We Serve begins with the sinking of a great ship, then flashes back to tell the story of some of the seamen who end up swimming for their lives. That chronology-bending structure—helped along by snazzy montages—takes advantage of the medium to make the movie very different from one of Coward’s plays. He reportedly listened to the advice of collaborators like Lean, who warned him that his original screenplay was unfilmably long and straight, and suggested he take a look at Citizen Kane to get a better idea of how to make an ambitious, multi-character story more cinematic. But Coward didn’t need any steering when it came to writing characters or directing actors. In addition to casting himself as the ship’s Captain, he has a young Richard Attenborough as a petrified sailor, and John Mills as a sturdy sea dog whose thoughts keep turning toward his family. These men and more—plus a number of talented women—help convey the richness of life and culture in the United Kingdom, illustrating how the citizenry could be brave and helpful whether manning a gun or cooking a meal. In Which We Serve is the best kind of propaganda, aiming to flatter its audience’s sense of decency, rather than stoking their fears. Availability: In Which We Serve is available on DVD and Blu-ray (including as part of Criterion’s excellent David Lean Directs Noël Coward box set) and can be streamed via Amazon Prime and Filmstruck.